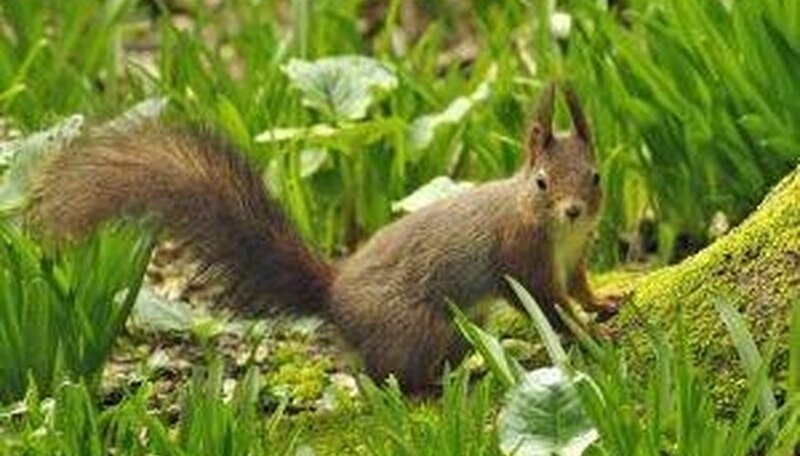 Squirrels are cute to watch when they are at a local park or zoo. At home, however, they are cause for concern. Squirrels carry ticks and fleas that can infest any pets that you own. If you allow squirrel to reign over your lawn, there is a good chance they will move in to your attic and begin wreaking havoc in your home. Replace your bird feeders with squirrel-proof bird feeders. This will discourage the squirrels from coming to your lawn to eat and they will begin to migrate to a lawn that does have accessible bird feeders. Keep your yard clean. This is very important because the squirrels are visiting your lawn for food. They will eat leftover food out of your trash can, fallen seeds from the bird feeder and even bits of food from your BBQ grill. Install wire fencing around any vegetable gardens or flower beds. The key is to begin the wire fencing at least 8 inches below the ground. This will prevent the squirrels from digging under the fence and getting to your veggies and flowers. Use a product like Shake Away (see resources) which contains fox urine. Foxes are predators of the squirrels and the squirrels know it. By placing Shake Away in various locations throughout your lawn, you will deter the squirrels from coming on your property. Save an empty gallon milk jug and clean it out. Then fill it back up half way. Watch for a squirrel to enter one of the holes he has dug in your lawn. Then place the milk jug upside down over the hole allowing the water to pour in to the hole. The squirrel will then try to get out and go up in your milk jug. Place the cap over the milk jug and let the squirrel go at your local park or zoo. You can add Squirrel Away to your bird feeder for extra protection.